I am a big, big fan of prop replicas. One of the first things a visitor sees when entering my house is the fantastic Hasbro Captain America shield, which permanently hangs on my study door alongside movie posters from Nolan's Dark Knight trilogy. I love great replicas that can be displayed as well as played with, and Hasbro's very nicely priced Cap shield prop is one of the best I've ever encountered, made of sturdy material that can be played with or worn with cosplay, as well as hung up on display, for a fantastic price. It looks and feels like something much more expensive, even competing with the higher-end replicae. This year, in the lead-up to this week's Infinity War, Hasbro has released an Infinity Gauntlet in the same series, based on the movie design. How does it compare? Read on to find out! 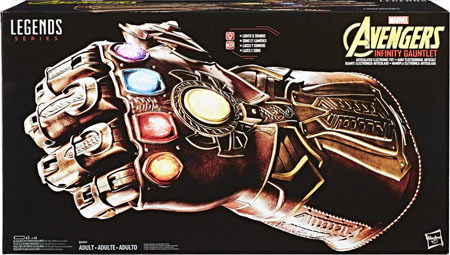 The Infinity Gauntlet comes boxed in this enormous black box, which easily opens up to reveal this in all of its majesty. 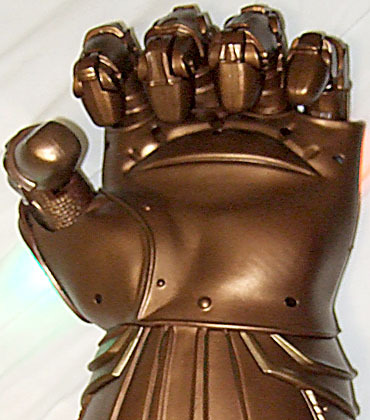 With the fingers curled into a fist, it's about 17" long, which looks accurate to the on-screen glove Thanos wears. It is primarily sculpted out of bronze-looking plastic with a paint wash to bring out detail. The Infinity Gems look very nice out of the box, then pressing on the main yellow gem (the "Mind" gem) lights them up with the replica's light and sound action, with appropriate "powering up" noises. The lights are very bright, I'd argue too bright, because the effect makes the glove look a little tacky. It's fun, though, to have something like this, and they're optional - you can always have the lights off if you want. 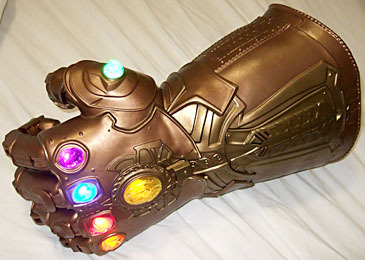 The first thing you'll notice taking this out of the box is how light the Gauntlet is; even worn it doesn't feel like a hefty replica, no doubt so that children can still wear it, but not light enough to feel flimsy. This replica is durable, but because of the weight you immediately can tell it's more of a toy. The sculpt, however, is very nice, it looks very good and photogenic; there's some attempt here to hide the articulation in the fingers, but ultimately this was a concession made in order to maintain the ability to actually wear it, which is the major difference between this and the high-end replicas aside from the pricepoint. The glove doesn't actually work like a glove: instead, you slide your hand in and grip around the handle inside, then put your fingers through the ringed-levers and pull each to work the fingers and thumb. This is the same kind of mechanism you find in some ventriloquist dummies, and it works pretty well here. You're not going to easily play the piano with this, but you can definitely jerk yourse wear it and run around pretending it's your own hand like a child. I had a lot of fun with this, and a button underneath the yellow gem allows you to freeze the fingers in place so you can keep it balled up in a fist for display. 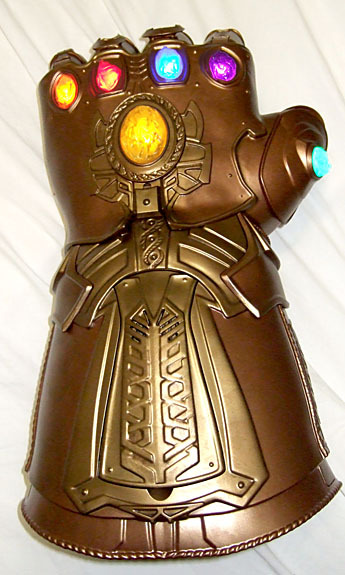 While this Infinity Gauntlet doesn't include a stand for display, the design smartly allows it to be posed "standing up" when not being worn. It's basically ideal for your Home Theatre if you want to have this around to be admired and to be played with, but it wont stay standing with any force applied to it; no doubt a stand would have been nice, but unlikely for this pricepoint. 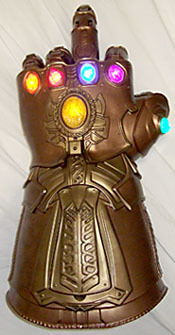 And that's the Infinity Gauntlet. I quite like it; it isn't going to fill your desire for a high-end replica like the Cap Shield might, but it's certainly a lot more fun than a non-moving thousand dollar replica that can't even be worn. I think it's worth the asking price, even if it isn't quite worthy of a permanent display fixture.